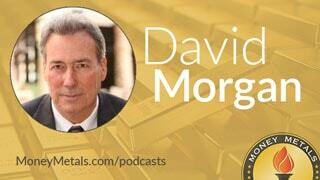 Mike Gleason* interviews David Morgan about the recent consolidation in gold and silver prices. Interestingly David felt there was some strength in the pattern we had seen which could kick in after the Labor Day holiday – a pattern which has already come about. The interview was conducted last week, ahead of the G20 meeting and the weak economic data which propelled gold and silver upwards before and immediately after, the U.S. holiday. Mike Gleason: Coming up we’ll hear from David Morgan of The Morgan Report and co-author of the book The Silver Manifesto. David tells us how long he thinks the correction in the metals will last, why he believes this November’s election is less important than you might think and also talks about a key event coming up that could put a lot of pressure on the U.S. dollar. Don’t miss a wonderful interview with our good friend David Morgan. Well now, for more on the importance of sound money and what’s ahead for the markets, let’s get right to this week’s exclusive interview with the man they call the Silver Guru. Mike Gleason: It is my privilege now to be joined by our good friend David Morgan of The Morgan Report. David, I hope you’ve been having a good summer and welcome back. It’s always a pleasure to talk to you. David Morgan: Thank you very much, and yes, I have been having a wonderful summer. Thank you. Mike Gleason: Well, as we begin here, David, please give us your thoughts on the recent pullback in the metals. We’ve maybe been overdue for a correction for a while now. I know in following your work, you’ve been calling for one, and we’re getting it here. And after a fantastic first six or seven months of the year for gold and silver, we’re finally starting to see some real selling pressure emerge. What is your take… what have you noticed during this mini-correction, and what are some of the reasons for the pullback? David Morgan: Well, I’ll start with the reasons. In any market, even in a non-manipulated market, which there is probably none. The stock market, bond market, metals markets, futures markets, options… just about everything out there is geared and leveraged and pretty much manipulated by the trading algorithms, and other means, but regardless of that, all markets move up and down. Nothing goes straight up or straight down, and so there are periods where there’s profit-taking, there’s periods where there’s consolidation, that type of thing. So regardless of manipulated or not, all markets ebb and flow. So the metals markets are no different in that aspect. What we saw in the silver market was over the last two months’ time frame, we peaked out in the spot month around the $20.50 area a couple times, and now we’ve dropped as far as about $18.50, so we’ve had about a $2 drop over the last couple of months. Specifically, the most recent drop’s really over a one month period. I want to be correct on that. The idea that I’ve had is similar to many others, and we’re kind of overdue for correction as you stated, Mike. So this is actually a healthy thing. The metals stocks certainly have leveraged both directions, so anybody that’s invested in the resource sector, particularly gold and silver stocks, is going to see a multiple percentage-wise on the drop. And some of these stocks actually gave us a clue that the consolidation or the correction was coming, because some of these sold off before the metals actually had started to sell off. What’s interesting, Mike, is that the selloff, even though it’s been a fairly good drop, $2 on a $20 commodity, you’re looking at about 12% or so, hasn’t dropped the commitment of traders… or the open interest, I should say, on the commitment of traders… very much, which means that the bulls and bears are still pretty equal. There’s still a very strongly held commitments to the silver and gold paper paradigm that futures markets more than I would’ve seen in a very, very long time for this kind of a price drop. So let me restate that. The $2 drop in silver and a correspondingly percentage-wise drop in gold, normally, you would see a pretty good sell off in the open interest. In other words, the shorts would be winning the battle. That is not what I’m seeing at this point in time. We could see something different after the Labor Day holiday. I’m not sure, but right now, these metals for the whole year, and even during this correction, are acting extremely strong. Mike Gleason: So in your view, it sounds like the correction might not be terribly long lasting. Is that what I’m hearing? David Morgan: Yes, not long lasting. Maybe another month. There’s a lot of things happening this month, as we’ll talk about later. The August low is habitually seasonality-wise very accurate for gold. You usually get the lowest price in gold in August. We’re doing this in the 1st of September, and September is usually a rebound month, but the seasonalities haven’t worked very well in the metals markets for quite some time, so I don’t put as much credence in them as I used to. However, in the end of the year, you’ve got a rise in the metals, and we haven’t seen that in a while either. I’m just going to let the market dictate, but here’s what I’ll say. The main support on the silver price is around the $17.50 to 17.60 level, so we might see another drop, and I really think that that level, another dollar down, is about as far as these guys are going to be able to push it down. On the gold side, it’s holding above $1,300 which has fairly good support. Not really strong support, because time-wise, it hasn’t been above that level for a long time during this rally of the last six months. So I believe we’re going to see a huge effort to push gold below the $1,300 level, and we have to just see how it reacts, if it rebounds quickly or not. And of course, more important than that, pretty much at the volume that takes place. In other words, if that causes a large selloff and the algorithms start to move with the shorts and the longs decide to throw in the towel and starts a waterfall decline, then of course, I’ll do an update for The Morgan Report members, show that to them. Right now, it’s too hard to call that. I don’t see that. In fact, my suspicion is that that’s not going to happen. In other words, they’ll push it down below $1,300, but it will pop back up fairly quickly. So it’s very interesting to watch the metals this year. Mike Gleason: Talking about some of those key events that are coming here over the next month. We’ve got the G20 Meeting coming up. I know you want to comment on that. Also, China’s going to be part of the IMF Special Drawing Rights. I believe it’s October 1st. Comment on those two international events there. David Morgan: Certainly. I think it’s very important, and this is the big news of the month of September. One is that, I think it’s the 4th and 5th of September, China will be hosting the G20 Meeting for the first time in China. And I think they will be running the meeting pretty much. And at the same time, at the end of the month, I think it’s the 30th of September, the yuan will be weighted at about, I think it’s 10% of the SDR, Special Drawing Rights. So the international currency system run by the IMF, which is really run by the United States and International Monetary Fund, will be embracing the yuan as part of the SDR. And also, you will see a lot of settlement that will take place outside the U.S. dollar. For example, petroleum historically has been settled in U.S. dollars only, and this has caused a great deal of the banking system throughout the globe to hold dollars so they could make settlements, because everybody buys oil. And now, you’re going to see settlement directly in yuan, which means that this is going to put downward pressure on the dollar, which could be a reason to raise interest rates. This thing about the economy’s great, we need to raise interest rates like we used to have back ten, twenty years ago, is preposterous. Anyone who takes just a cursory look at the real numbers and understands what’s really going on with shows like yours, mine, and many, many others, knows that there’s no way that the recovery has really ever taken place in any substantial way since the 2008 financial crisis. Sure, there’s been pockets here and there, but the overall economic picture’s really just gone sideways or gotten worse. However, if there’s pressure on the dollar, they could use that meme, that idea, that propaganda, that, “Oh, look at the unemployment. Look at how good we’re doing,” and this type of nonsense, “Well jeez, we really have to raise interest rates,” when actually the reality is that because there is a further weakening of the dollar and there’s negative interest rates throughout the bond market on sovereign debt, but not in the U.S. yet, that it could happen. I’m not saying it will happen, but my thinking is a little different than almost anybody that’s in my peer group on this matter, Mike. Again, I could be wrong, I could be right, but I certainly want to voice it because I want to get people to think, and the only way to keep the dollar strong, let’s say “strong”, would be that it’s got a positive rate of return when all these other sovereign nations with the euro, et cetera, have negative rates, there’s going to be a move for people to hold dollars. And because China’s coming into the fore, there’s a move to not want to hold dollars, so you’ve got these two forces, sort of bullish the dollar and bearish the dollar. Very interesting times. Lots is happening, and I want to make one more comment and that is, as much as China has taken on the gold market in fiscal form for many, many years and built their reserves probably far higher than what the official report, I do not believe that China is ready to pull the gold card yet. They are just now entering into the global currency system in a meaningful way. They’re very patient and I think they’re more willing just to continue with this paper paradigm. They certainly caught the Keynesian disease years ago that have done the money printing to build out their infrastructure and to certainly boost their economic picture, which is of course distorted at this point just like everywhere else that’s based on the Keynesian model. But nonetheless, I don’t think they’re ready to switch horses to a gold-backed yuan or anything like that any time in the very near future. Mike Gleason: Certainly going to be interesting to see that push-pull play out there with the dollar. You bring up some good points there about strong dollar versus weak dollar. And I also want to get your thoughts on the election here. We’ve got the election season kicking into high gear. We’ll have the debates here pretty soon. We’re about two months away now from election day. What do you think a Trump victory would mean this November for the markets, primarily the metals since that’s what we’re focusing on here, and also what do you think a Hillary victory would mean? David Morgan: Well my view is different than a lot of people, but you want my view, my view is it doesn’t matter. My view is that it’s changing captains on the Titanic. My view is that Trump seems to resonate with a lot of conservative thinkers and I think there’s many, many Americans that are just absolutely, totally, and completely disgusted with the political class. I do think that you can make arguments either way, who gets in could move the price and we might get a blip one way or the other depending on who’s elected or should I say, “selected”. But regardless, I think in the longer term macro picture, it really means very, very little. I think we’re way too far gone on the debt paradigm overall that any one person no matter how well meaning they are, can really turn the boat, turn the ship. The Titanic has hit the iceberg. It’s taking on water, and you might get somebody stronger at the wheel and you might veer off, but it doesn’t really matter. The ship’s going down. That’s my view. Mike Gleason: Switching gears here a little bit, you’ve always had great advice for people when it comes to getting into precious metals. You’ve written your ten rules of investing in the sector and I know owning the physical metal is first and foremost in your view. So before we get into discussion about mining stocks, which I’ll ask you about in a moment, talk about why you recommend owning the physical bullion before you do anything else. David Morgan: Well almost anyone that’s in this sector, and that could go from anybody that’s a prepper or as extreme as a survivalist or someone that’s familiar with financial markets and monetary history, everyone understands that we’re at risk at all times, and especially now. We’re in a situation on a global basis we’ve never been in before, which is that the reserve currency of the world is failing, which means you need something outside of the system. You need something that’s not electronic-based, you need something that has no counterparty risk, you need something that’s universally recognized, and you need something of high value that could be used anytime, anywhere by anyone. That of course is gold and/or silver. This has been the case. So if there were, let’s say, a problem with the banking system where we go to the report that’s for free on TheMorganReport.com, you might go there, give me an email, and a first name. You’ll get the “Riches and Resources Report,” which shows you what happened during the currency crisis of 2000-2001 in Argentina. The film’s name is The Empty ATM, and they did not take your bank accounts. They just basically sealed them, where the money in the bank was held by the bank and they allotted you so much you could take out on a weekly basis no matter who you were, no matter what your account size was, and then they devalued the currency, which is basically stealing from you. So this is what took place. I say all that to state how emphatic I am, how important it is for people to have real money outside of the system. Those people in Argentina that held some of their wealth in gold and silver circumvented the devaluation and also had readily available, recognizable and cherished real money that they could barter with, which took place all over the country in Argentina during that currency crisis that I just mentioned. So I really, really believe that this could take place in other areas of the world, certainly if you were in Venezuela right now and you had some precious metals, you might not have a smile on your face, but you certainly would be better off than the people that didn’t. Mike Gleason: Are there any products that you prefer over others? For instance, in silver, do you generally recommend coins versus bars or coins over rounds? Does it even matter, or is it just about getting the most ounces for the money, or do you want variety? Give us your thoughts there. David Morgan: Yeah, in the “Ten Rules of Silver Investing,” I said you should strive to get the most ounces per dollar you want, or whatever currency you have invested, which means first of all, small units. You definitely want to start with small units. You don’t want to have one 100-ounce bar, and that’s your silver holdings, because now you’re in a fix. You’ve got to make one absolutely correct decision when to turn it back into fiat currency or barter with it, whatever. So you want small coins if you have rounds, but if you’re particularly interested in recognizability, for example, and you want a government-stamped coin, you’re willing to pay a slightly higher premium, I have nothing against that. Also, the constitutional silver or what’s known in the trade as “junk silver”, I think that’s still a good way to go. The bag market is actually fairly tight. So much has been smelted down into bars, there isn’t a lot of it around, actually. Small units. Rounds or recognizable coins are the way to go. I think you can start with silver if you’re modest means. If you have better means than that, I think you certainly should have some gold. You should actually have both if you can afford it. And I also think moderation’s the key. I think a 10% holding in physical metal is probably more than is sufficient for most people. There are people like me that have a great deal more than that involved, but this is my life’s work. This is something I understand and I understand the risks, and I’ve been with that type of risk environment for a very, very long time. For most people, just a 10% amount in physical, and for those that really want to gain leverage and maybe triple their gains, certainly that’s available, but it’s a situation that demands study and work. And that would be through the Resources Sector, which is what we’ve specialized in for a long time. Mike Gleason: Leading me right into my next question here, turning to the mining stocks. It’s been an outstanding year for the miners, the recent pullback notwithstanding. Now, if you look at the silver spot price, it’s up more than 35% since the first of the year, but if you look at the mining sector, gosh, David, we’ve got the HUI Gold Stock Index up nearly 100% for the year and the GDX is up over 120% year-to-date even with the big pullback in the last few weeks. So things are finally starting to look up after a rough very few years for everyone in the Sector with many stocks down 80% of more since the 2011 peak, assuming they even stayed in business, but talk about the miners. What are you looking for here in the second half of the year after a great first half? David Morgan: I’m actually looking for further gains by the end of the year. I think we’ve still got more work to do in the downside, and as I said earlier in your show, Mike, I think probably another month. I think by the time that the SDR takes place and people, the markets, I should say, understand how much dollar damage is done or not. We’ll have to wait and see. With the yuan being more accepted not only by the SDR but in final settlement rather than having to go to the dollar directly. As that settles out, I think you’ll see more and more consolidation into the precious metals and more push for them to go to the upside. So it’s a situation that most of the large funds money managers, pensions even, that missed the 2008 bottom in the precious metals during the currency crisis, have woken up early this time and have moved into the paper paradigm of the gold and silver markets, which means that the open interest, as I said earlier on your show, is very, very high relative to what it’s been historically, and these are strong hands. On top of that, the Shanghai Gold Exchange has a very, very large open interest themselves, and they’re trading from the long side vis-a-vis the commercials or the banking system that trades historically from the short side on the COMEX. So you’ve got big money that got in relatively early in both gold and silver, because they understand that the stock market is too high and they want to be hedged. They have no real philosophical reason to own gold like we just outlined in the last question, but they manage money and they need exposure. And the best way for them to get exposure is to buy it on a leveraged basis on the paper markets. So that’s what’s taking place. With the addition of the Shanghai Gold Exchange ramping up the amount they’ve purchased on paper, and of course, that’s much more physical marked than the COMEX is. So again, there’s that really strong bull/bear back and forth and so, just to close out, I really don’t see these metals coming down a whole lot more or a whole lot longer, and I think this year is going to be one that people look back on and say, “Jeez, I’m sure glad I bought my metal or bought my mining shares during 2016.” By the way, The Morgan Report comes out this weekend right before the G20 Meeting, and on top of that, we’ve got another company that will be probably putting out mid-month, mid-September, an updated analysis, an appraisal on the mid-tier producers in the gold complex. And this is after it’s made two transformational acquisitions in 2016. This is the kind of research we do. If you go back another month, we had like four or five speculative situations that are going to show up in these other newsletters that cost like three or four times what ours does. We see that all the time. Not that we certainly haven’t gotten ideas from others, because we have, but it seems that whatever we do our research on seems to be picked up by let’s say a lot of people in the industry. I’ll just leave it at that. Mike Gleason: Well it’s great stuff as usual, David. We always appreciate hearing your thoughtful analysis here on our podcast, and I’m sure we’ll talk to you again very soon. Now, before we let you go, please tell folks how they can get involved with The Morgan Report, because this is a fantastic time for people to dive deeper into the metals and miners. I think they understood that by listening to our conversation here… it’s especially a good time after this recent pullback and this pause in the upward movement we’ve been having. Please let people know how they can get on your email list and also about some of the other things going on there at The Morgan Report or about the book, The Silver Manifesto. David Morgan: Certainly. On the book, we’ve gotten great feedback from people. It’s probably one of the best $30 investments that you can make. You can get it on Amazon, you can go toTheSilverManifesto.com and read one chapter for free and get kind of an overview, you can read the reviews on Amazon. There’s a whole chapter on how to pick a mining stock, and we actually spill the beans and show you exactly how we do it. And again, we’ve gotten feedback that’s been extremely positive for those types of people that have the time, energy, and motivation to do their own analysis. We take you through step-by-step, so that’s something you can get out of the book along with a lot of other material. As far as The Morgan Report, what I actually urge everybody to do is to just go to the website,TheMorganReport.com, and get on our free email list, and get our free “Riches and Resources Report.” In that report, you’re going to get two movies to watch for free. One is The Empty ATM I mentioned earlier and the other one is The Four Horsemen film, which is the end of The Age of Empire, and it’s very, very good thought-provoking types that are interviewed during that paradigm with some solutions to the problems at the end of the film. And that’s just two things you get in that report. You also get ways to accumulate silver and gold over time, you get some insights, and of course, once you’re on the list, you will be appraised of an update every weekend by yours truly, myself and or one of my staff. Mike Gleason: Yeah, it’s great stuff. I’ve been on your list for an awfully long time. Always enjoy it every weekend we get an email from you, and it’s excellent information. The Silver Manifesto, as you mentioned, is another great resource. We’ve sold about 1,500 on our website, MoneyMetals.com. A lot of people are really enjoying that book and I know you’re doing very well with that in a number of different places and we wish you continued success there. Well thanks so much. We really appreciate it, and I hope you have a great weekend, enjoy the rest of your summer, and we’ll talk to you again soon. Thanks, David, and take care. David Morgan: My pleasure. Thank you. Mike Gleason: Well that will do it for this week. Thanks again to David Morgan, publisher of The Morgan Report. To follow David, just visit TheMorganReport.com. We urge everyone to sign up for the free email list to get his great commentary on a regular basis, and if you haven’t already done so, be sure to pick up a copy of The Silver Manifesto, available at MoneyMetals.com, Amazon, other places where books are sold. It’s almost certainly the best resource on all things silver that you will find anywhere, so be sure to check that out. *Mike Gleason is a Director with Money Metals Exchange, a national precious metals dealer with over 50,000 customers. Gleason is a hard money advocate and a strong proponent of personal liberty, limited government and the Austrian School of Economics. A graduate of the University of Florida, Gleason has extensive experience in management, sales and logistics as well as precious metals investing. He also puts his longtime broadcasting background to good use, hosting a weekly precious metals podcast since 2011, a program listened to by tens of thousands each week.